Excerpts from an interesting approach to creating hollow polymer microspheres from a pickering emulsion. A solid-stabilized multiple w/o/w or o/w/o emulsion was prepared in a two-step process. Various nanocomposite polymer microspheres with multihollow armored closed pores were fabricated easily by suspension polymerization of the multiple Pickering stabilized emulsions. Spray drying has been used in the production of fine powders from emulsions for many years, but it is not a process in which most people associate the production of microspheres. This journal article shows how the authors were able to produce highly spherical microspheres in the 2-10um range by controlling the levels of Chitosan and crosslinking agents used. 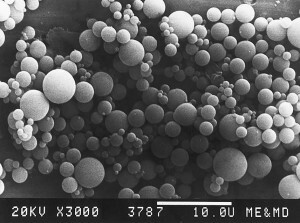 The quality of the microspheres that were produced, as seen the the attached SEM micrograph.